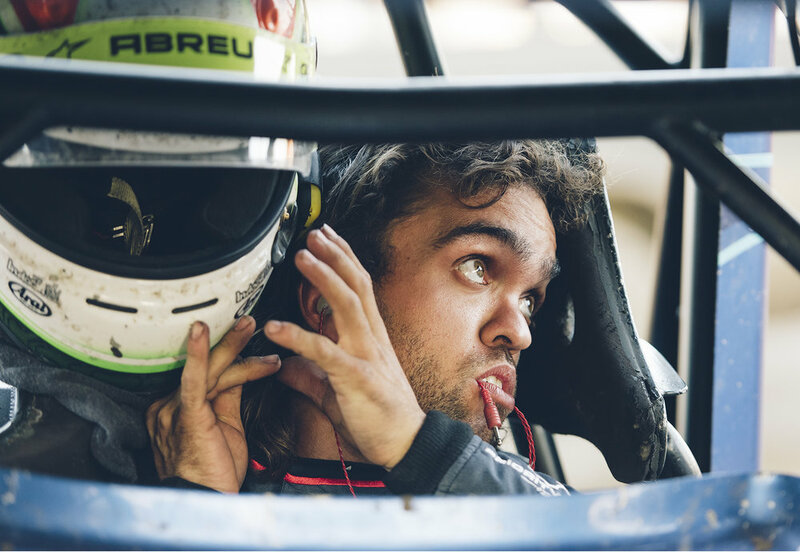 Feature | Rico Abreu, one of open-wheel dirt racing’s most popular drivers, has just won the 65th annual Gold Cup Race of Champions. The near-capacity crowd at Silver Dollar Speedway in Chico, CA, is buzzing and cheering with excitement on this Saturday night. Fans roar from the bleachers, ready to celebrate with the driver and some yell “Ricooooo!” as the driving ace unbuckles from the family-owned winged 410 sprint on the front straight at the quarter-mile clay track to wave to the fans. Abreu celebrates after winning the 65th annual Gold Cup Race of Champions at Silver Dollar Speedway, 2018. Having spent most of the summer traveling with the World of Outlaws sprint car tour in the East, Midwest and finally to the West Coast in September, the team has been on an ambitious schedule that will see Abreu compete in 85 open-wheel races in 2018. As the first event back in his home state of California during the tour’s West Coast swing, the race was a bit of a homecoming for the driver and his St. Helena-based Abreu Vineyards team. It’s been a challenging year for the young driver. With a crew chief change, Abreu is now working with an even younger crew chief, Drew Warner, 23. Midway through the 2017 season, Abreu parted ways with veteran crew chief Paul Silva, who had worked with Abreu during most of his earlier sprint car success. Abreu’s rise in the national motorsports world has been speedy but 2018 has found the champion driver setting a more level approach to his racing career. The son of a vineyard owner, Abreu started in Outlaw karts in 2008 and moved to sprint cars in 2011. In 2012, Abreu began competing at national USAC Midget events and continued his success in 2013, winning 12 sprint car and midget mains. The following year, he won 25 times, including his first Outlaw race at Thunderbowl Raceway in Tulare, CA, and the USAC Midget Series national title. In 2015 and ’16, Abreu won back-to-back Chili Bowl Nationals and began competing in NASCAR, driving a full-bodied stock car and in NASCAR’s national truck series. With NASCAR sponsorship woes for 2017, Abreu stepped away from the league and again focused on open-wheel dirt racing. He won 11 times in both winged and non-winged machines. Abreu makes a qualifying lap at Placerville Speedway, 2018. Preparing for a weekday night of action with the Outlaw sprint cars in the pits at Placerville Speedway, Abreu sat down to talk about his season a few days after his Gold Cup win. I know a lot of sprint car fans woke up happy on Sunday morning after you won Gold Cup on Saturday night…. Yeah! (smiling) That was a cool race. I always enjoy getting to race at Chico. After you took the lead, (on lap 26) you were getting some great restarts. I felt like my car was really good and when I got to lapped traffic, I felt like I could maneuver all over the track. Other guys were stuck in the top lane and when I got to the lead, I ran the bottom and it honestly felt really good on the bottom in (turns) one and two and in three and four, I knew I had to be up top. Man, it hasn’t felt that good in a long time. You know, you set the car up to be good at the end of these races and that’s when we were very well set up. Honestly, we drove home (to St. Helena) and I haven’t been home in about three and a half months… we’ve been in hotel rooms, or friend’s houses in Indy. But we got home and I just sat on the couch all day (Sunday). The boys live in Hanford so, they went home. It’s important to just shut down from racing and get away from it for a little bit. I went to see my grandparents and we had a family dinner on Sunday night. How’s the year going, personally? This year I’ve been focused on just my racing in general. I’ve been racing with such a young group of kids (crew) it’s made it a unique situation. This is as new to the boys who work on my car as it is to me. I’m on the leadership side and helping them… we’re all three trying to build a winning race team and we’re going in the right direction. It’s more about the consistency. You know, you win one night and it’s really fun and then the next night you show up at the track and it’s like we’re starting all over again. I think that’s motorsports in general until you find something that works really good for your team that you can use as a tool every night. We’ve been traveling a lot. I’ve been way closer with the team, more a part of everything—navigating the truck to hotels and directions. It’s been tiring at times but when you have success at races, it’s kinda like, man… I feel like people who work really hard for what they want, not just because they know they have to work hard, but because they enjoy it, they love it, you know—and then to have success—that’s the coolest part for me. How many races are you running this year? When it’s all said and done, it will be 85. I’ve had two sprint car wins, and they’ve both been World of Outlaw wins. I also won a prelim night at the Chili Bowl with Keith Kunz but other than that, we’ve kinda struggled a little bit. I haven’t had too many top fives, but I tell you, these guys, anytime they put me in position to win these races, I feel like we’re really good. Speedway Engines. They’re out of Speedway, Indiana, we’ve been partners with them for a few years now and I feel like they build a great engine. Rick Long. They do all the Toyota stuff for Kunz, too. Sweet Home Calistoga: Rico Abreu wins the USAC-CRA non-wing sprint car main event during the 2014 Louis Vermeil Classic. As of 2018, Abreu has 11 victories at the historic track. How did you put your crew together? My dad and I were having dinner and talking and my dad’s all about young individuals and pushing them through their careers and supporting them. There’s not many young kids out here working on sprint cars. There’s so much going on in the world. People have interests in other things but our sport needs that interest from young kids right now. Yeah, everybody wants to drive but nobody wants to work on the cars. So, I got three guys (Drew Warner, crew chief; Shane Watts, mechanic; and Greg DeCaires V) that are really young. They’re not worried about how much they’re getting paid. They just want to be part of a successful race team. That’s what’s driven them and our deal to where it’s at right now. Drew is the leader of our team and he’s 23 years old. I’m really close family friends with them. Drew was looking to travel more in racing and I was looking for a crew chief and it all kinda worked out. I knew it was going to be kinda tough for him because I had come from a winning team with Paul Silva—with way more experience. Now I feel like we took a step back, more for the longer run, for Drew to learn as a crew chief. I feel like he’s picking it up a lot faster than anyone ever thought. He’s doing a really good job. His dad is Ricky Warner, Donny Schatz’s crew chief. His family has always been around racing. He kinda went back and forth between school and being on the road with his father on the Outlaw tour and then he ended up getting a job with Dennis Roth. He moved to California and got a crew chief job with one of the Faccinto boys. So, Drew found a little better opportunity with our team to further his career, travel and race bigger races. Some teams can’t afford to travel as much as we can. We’re a family-run team. We have some pitch-in sponsors that do a bunch for us but Abreu Vineyards pays for the majority of the racing and that’s what makes it a luxury to race…. How was the parting with Silva? We just made a change. I feel like sometimes things run their course and it’s time to move on. I was kinda in limbo there for a little bit but Drew came on in the second week of May. It was right when I was leaving California with the Outlaws and he came on to take over this whole team. Obviously, winning Gold Cup, Ironman—the Outlaw races—traveling with these guys and learning how to be a people person. You must’ve had some fun out there on the road, right? We got to see Mount Rushmore. That was really cool. We went to some obstacle course parks where you harness up and climb around on big trees and stuff. We’ve been racing so much, it’s hard to get away and do things. We went through Seattle and went to Pike Place Market and that was really interesting to me. The concept of it being a farmer’s market every day is amazing. What was it like to grow up on a vineyard? It’s more of a farmer’s area—tractors, dogs, cattle—really farm-y. This time of year, September-October, is harvest so, there’s always something going on. My dad started in the vineyard management business in 1980, and I was born in ’92 so, it’s been around longer than I have. I live at home in St. Helena, and I love being outside. The Napa Valley is beautiful. I’ve been there my whole life. How did you and your family get involved in racing? I had some neighbors that raced (shifter) karts and I started going to the kart races with them. I enjoyed it so much and my dad got me a (QRC Outlaw) kart for Christmas when I was 12 or 13 and we built a (0.125-mile dirt) track at our house and I went a year, just running at our track on the weekends and then I started racing the following year in ’07. And, in ’08, I started racing karts competitively every weekend and in ’11, I got a sprint car with the Kaedings and it’s been uphill since. This is my seventh year racing sprint cars. How did the Kaedings adjust the car for you? Brent (Kaeding) made all the special adjustments to the race car for me, with John Santomauro, the chassis builder in San Jose. I still use that same set up with our cars now. They moved the A-frame, where the seat is, forward about six inches and they put in foot blocks and moved everything up another six inches as well. You can look in our car and you don’t really see a difference, it’s pretty cool. Abreu powers into turn three in his USAC wingless sprint at Calistoga, 2015. You had such a fast rise through the ranks to NASCAR. It went really quick, yeah, within about three years. I think it’s my passion. I found something that I really enjoy doing and I got the taste of winning and being around really good people that could bring me to the next level. I was around the Kaeding family and then I went to Keith Kunz and to Paul Silva in the sprint car and that’s what changed my success rate. When you get around people that are really good at what they do, everyone’s expectations are high. I know my job and they knew their job is to win races. We didn’t accept not winning. Now things are structured a little differently with my team because I’m with such a young team. They’re learning, I’m learning, it’s not so cut throat, like it was when I raced with Paul Silva, which was intense. I bring those expectations to here now. They know where the bar is set and we need to be running well consistently and we’re not going to stop until we get to that point. You won Chili Bowl in 2015 and started racing the K&N NASCAR Series during the same year, did you feel a lot of pressure to succeed in NASCAR? The direction in the NASCAR world wasn’t for me. I felt like we couldn’t find the financial backing to push me to the next level and I didn’t want to use my family’s hard-earned money. In that industry, I feel like it’s more about the equipment and the people, instead of just the driver. I feel like you can make up for that here (sprint car racing) as a driver. It takes money to be with the best people—it takes a lot of money—and we weren’t in the position to put myself there. And, I don’t really see myself going back. I enjoy sprint car racing. Sprint car aces Daryn Pittman, Abreu and Christopher Bell in the pits at Cocopah Speedway, Somerton, AZ, January 2016. Abreu races his outlaw kart at Cycleland Speedway during Kyle Larson’s inaugural Outlaw Kart Showcase, 2015. Old friends, Kyle Larson and Abreu in the pits at Antioch Speedway before the 2013 World of Outlaws race. You grew up and raced with other successful drivers, including Kyle Larson, how do you remember that experience? I feel like those guys have always pushed me to be better, just because I’m great friends with all of them. And, you always want to beat your friends, especially when they’re having a lot of success in their career and there’s a lot of attention around it… It’s been like a rabbit to chase—Kyle, Christopher Bell—that’s what got me better and better every week. I just wanted to beat them. I know some of your biggest fans are kids. Kids are really big to me, I think more so, because I’m this smaller person that’s their height but they know I’m older because of my beard and I race and I think I give them a lot of inspiration that they can do whatever they want when they grow up. I’m just going to keep trying to run the World of Outlaw races and try to win more. I think that’s where I see myself in the next five years. I don’t know if I see myself being a full-time World of Outlaw member but I want to be winning a lot of races throughout the year—wherever it pays—and be more of a true outlaw.